"The customer is not your spouse; she is your boss!" A masterclass on building vibrant relationships in the market by dancing with the customer! It Takes Two to Tango builds a case for how we have emerged into a customer dominated, shape-shifting world. Building customer connect needs to be seen as investing into our customers as the most valuable asset of an enterprise. It Takes Two to Tango shows how the route to building customer equity is only through delighting our customers with outstanding customer experience. It Takes Two to Tango is about how we need to, and can, master the management of innovation. It Takes Two to Tango talks about building the organisation as an organic ecosystem in which key members of the team are empowered to fulfil the entrepreneurial task of leading the tango with customers. It Takes Two to Tango amends the famous Ogilvy quote to make it more relevant today: "The customer is not your spouse; she is your boss!" Each chapter presents a step-by-step guide to implement the recommended changes in mindset, strategy and business practice so we call fall into rhythm with our customers. 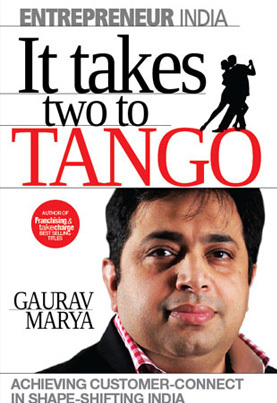 Replete with interesting business examples and practical insight, It Takes Two to Tango will prove invaluable to all marketers who want to build business on the most important revenue source in the world - sales income! Chapter 3: THE IMPORTANCE OF WOW!